Group Discussion Ideas > General GD Topics > India’s growing population – How can it be controlled? 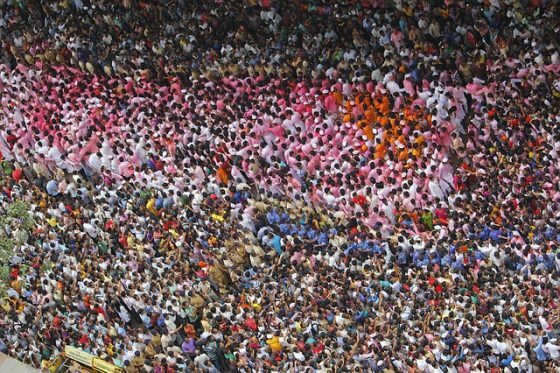 India’s growing population – How can it be controlled? According to Population Reference Bureau (PRB), India will cross China’s population by 2024, and will emerge as the world’s most populous country. As of 2017, India has 134 crore people, and China’s population is 141 crore people. Earlier, it was expected that India will cross China’s population by 2050. But the new report revealed that India’s population will cross China’s by 2024. India’s fertility rates are higher than China’s. In India, the main cause of low living standards and growing unemployment is its overpopulation. With growing population, it is very difficult for government to provide food, health services and employment to all citizens. India is the first country in the world to start family planning program. In 1952, India started working on the goal of decreasing fertility rates. ‘National Population Stabilization Fund‘ (NPSF) was setup in 2004 to take measures on population stabilization. India is a signatory of ‘Family Planning 2020‘, a global movement to give 12 crore more women access to contraceptives by 2020. Due to widespread awareness programs, almost all married women in India are aware of the contraceptives and surgical sterilization. Government incentives should be increased for families having one or two children. More awareness programs on importance of family planning should be conducted. Literacy rates need to be increased. With increased literacy rates and awareness, fertility rates will be improved. Though Child marriage is illegal in India, there are many child marriages taking place in India. Child marriages lead to high fertility rates due to lack of awareness. Strict action should be taken against child marriages. Improved health facilities in remote areas will help in improving fertility rates. The reason is that lack of medical facilities is causing low survival rates of kids in remote areas. Due to this, many people in those areas are giving birth to more kids. Still many Indians are treating their male child as their heir. This perception should go away. Increasing incentives for girl child’s education and medical facilities and creating awareness about legal issues such as women’s rights in India can help in solving this problem. China imposes fines on families that do not follow family planning. China is providing major incentives in education, health facilities and employment services to one child families. Countries with limited population can achieve high standard of living and peace. The new projections that India will cross China’s population in seven years is a serious reminder for India to focus more on population control. Along with conducting awareness programs, government should give more incentives to improve fertility rates. Actually in my opinion population is an asset to indian because the entire world is looking towards india in its growth ,where population plays a major role.